Do you ever feel overwhelmed or stressed? I can't honestly say that I do. Whatever you believing is what is overwhelming you, not life. Life never overwhelm anyone. you're really only doing one thing, and everything else is what you're believing. Well, you know, uh, Einstein said, the most important question to answer is the universe is friendly. And so I fell into that answer, not even knowing there was a question about 20 years ago. And nothing has changed my mind about that , the universe is friendly. And anytime anyone's mind looks out and perceives something as not friendly, they're going to feel stress. They're going to physically feel stressed that mind identified. Okay, the simple version , uh, anytime you judge anything or anyone as ,uh, as not friendly, not for you, as unkind, you're going to feel that as stress ,or out of order. you're gonna feel that as stress. So what the work does is , uh, we question our thoughts about the world, our stressful thoughts about the world,and we come to see every time that the universe in fact is friendly.It's all happening for us, not to us, and there's no expection to that. (No matter what happens?) Wars,famines, cancer, all of it, all of it ,no mistake in the universe, it's nature is friendly, and that's why I'm inviting everyone that doesn't see it that way to , to identify their thoughts about reality,write them down, and get very still, these four questions and the turn around. This is meditation,it's mental yoga(Right),and it's very important for people who really want to end the war in the world. Because if you don't do war with yourself, uh, you would just automatically know how not to do war with the rest of the world. Oh,well ,that makes sense.you know, and that so, I can like feel that or see it , whatever you want to call, think it.you know , that imagine if everybody questioned everything ? (Yeah) As if it were true , it would stop the war.. Okay, so, it's a terrible thing that your child died. Is that true? Can you absolutely know that it's true? and look how you react when you believe that thought. (It's..you know..) Your world ends. (Right) Your world ends, but only to your deathbed , and everything else becomes second best. The sadness immediately takes over.I mean, there're a person could sit in this. How do you react when you believe the thought, that, uh,it's a terrible thing? and you just sit in that again.This is meditation. And then the fourth question, who would you be without the thought that your child's death is a terrible thing? And I'm not asking people to, to do this.I'm not even expecting them to. 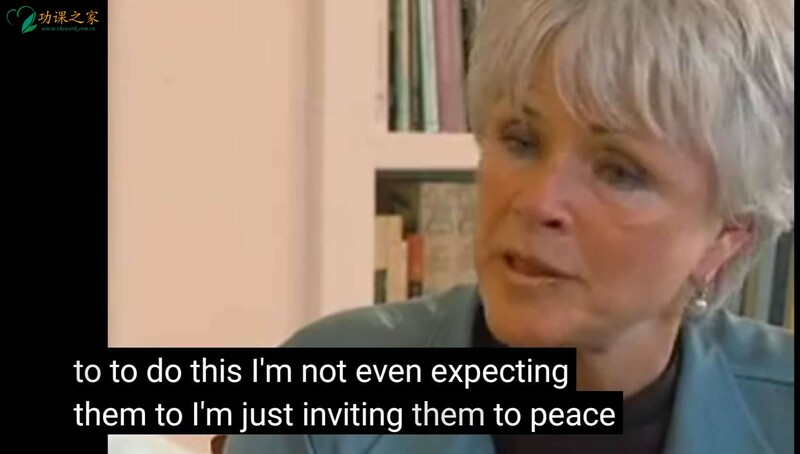 I'm just inviting them to peace. I invite them to reality. so, so who would you be without the thought? Now, I'm ansering this, because I kind of...What if the answer is "not a good father"? Yes, a terrible father. (Right) And terrible fathers are fathers that are so confused that they, that the daughter's or the son's death isn't enough misery. They have to be miserable the rest of their lives because of that death. That does not make any sense.(Right). The death of a child is enough. That is enough suffering, so how do you react? you become sad, you teach the other four children that death is a terrible thing, that it is the worst thing that can happen. They lose their parents just like that. There go their parents. There goes their harmonious family down the tubes(right) . That's misery! That's the effect of believing， basically that the universe is unfriendly, that that's a terrible thing. But for me, who would I be without the thought? Woman sitting in chair. (Right, right, okay) With the child, woman sitting in chair; without the child, woman sitting in chair，talking to friend. That's reality.That's reality. In the same way I'm doing it right now. So the turn around. My child's death is a terrible thing. the opposite turnarounds are simply taking the concept to the opposite. (Right) And not being tricky with it. There's no sideway to do it. Just using the same words finding opposites, and putting ourself on it as a opposite. Let's say, that's a terrible thing,my child's death is a terrible thing. Turn around, my child, what is the opposite of terrible？Wonderful. My child's death is a wonderful thing. Okay. If the universe is friendly. Why is it better for your child? Why is it better for you? Why is it better for the world? if the universe is friendly.And so, answer that. And if you find one, you can find one reason, you can find two, if you can find two, you can find three. If you find three, be live in that polarity until nothing moves you from your nature. (Right,I mean, you know the thing,) Not your child's death, nothing(can move you). I mean what I can definitely see is that ,you know,and it's hard because it's a thought. I mean the thought's powerful,you know, it's almost like,It's kind of like when someone dies, you know, the thought of them that keeps them alive. But when I have the thought of my child died, it's almost like I can , it's almost like it's happened, you know not, the thought is real, because you know, oh my God, you know.. So I.. But you know,I can definitely see that there's, It's very hard for me to say, but I can definitely see a power in the turnaround. Because I'm still here(Yeah) for everyone else and myself. (And life is a wonderful thing.) Yeah, I know it's true. Okay. And then another wonderful thing? you know what's another, you know, they don't have to suffer. (Right) And, and, and, Uh,(They won't have to go through,,, I mean , I can tell you lots of stuff..)Okay, so , death becomes the most exciting celebration, it is not to mourn, it is to celebrate. So,let's look at the another one, um ,my child's death is a terrible thing. My death is a terrible thing.The death of you,the father that you were to your other children has just died, he's grieving, with the child that went, went you. and that was the father of the other children that are left . You're too busy suffering to prove how much you love the other child, and that's not doing your other children a lot of good, and also we are teaching them to suffer rather than celebrate death and what is. So another turnaround it's a terrible, um, my child's death is a terrible thing. Um, my thoughts about my child's death are a terrible thing.